Drawing is one way to observe and locate material meaning within the physical, visible world as fact and yet also as a vehicle for exploring that which is invisible through imagination, intuition and experimentation. Ideas from such research collide in a process of chaos, or at times a structured open mindedness. We draw to think and search for new form in order to make sense of the horrors we see and hear as well as the beauty and humanity we experience. Drawing as a discipline in itself provides few barriers and does not hold a tight-rope to methods but its appropriation. A small doodle on the back of an envelope may prove as worthy in its sensitivity and communication as well as a focussed and prolonged act of drawing on a precious surface. But of course works on paper or the like is not the only answer, valuable in content as it still might be. The extended notion of drawing is exciting and its methods and materials continue to intrigue and stimulate creative action in the postmodern world. Wittgenstein (1975) stated in his book Philosophical Remarks: ‘We do not start from certain words, but from certain occasions or activities’ (p.82), as words only refer to the world. For my residency at DRAWinternational, I have created a collection of drawings that take flight from Gaston Bachelard’s rhetorical question in Air and Dreams: ‘can the study of fleeting objects be a subject?’ I rise to answer Bachelard by considering the matter of Cloud. Ever changing and forever in motion, clouds embody our contemporary desires to disperse, distribute and ultimately, melt into Air. 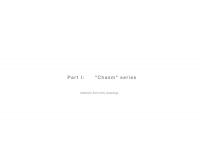 Extending Bachelard’s query, I ask, how do we give form to things we have not seen? How do we give form back to things we cannot retain? My process relies on a material imagination to fuse technology, technique and tools with the essence of matter through drawing. 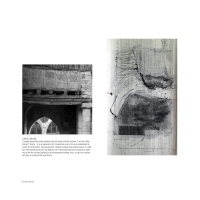 Simultaneously, my background in architectural design motivates me to explore drawing techniques that breach prescribed categorisations of design representation. The synaesthesia we experience in spatial order can only teach us more about the alternate capacities capable within our representational technologies. For each of us, our memories contain the remnants of a unique trajectory through life. Recent experience is organized and then superimposed over the decaying remains of the past; much like human history itself. Memory is selected and constrained by the structure of the mind as well as the attitudes and concerns we each bring to our individual sensory worldview. Ultimately, we are our memories. Working from a background in biology and cognitive science, I explore the mental processes that direct the process of my drawing. 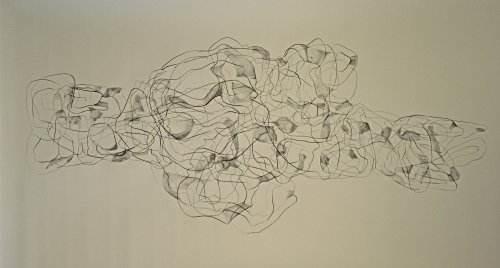 I assume that the memory of perceiving and acting throughout my lifetime results in the unique lines and forms that emerge in my abstract drawing. 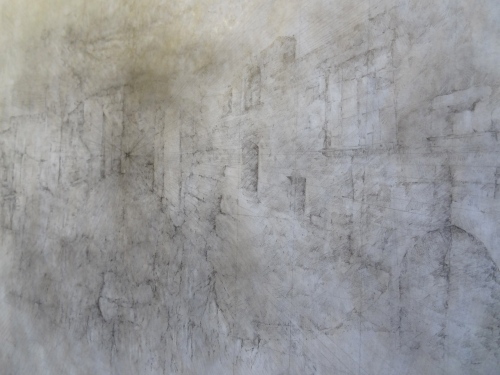 I am interested in how a drawing reflects the artist’s unique experience as maintained in the patterns of memory and also the way memory changes over time through decay, rebuilding, integrating and alteration. In my artwork I explore the ideas that the cumulative memory of perceiving and doing results in a particular pattern of mark making, line and form at that moment in time. Abstract imagery makes this visual language more apparent to me. The themes of the individual are informed by memory and memory is, for me, the ultimate abstract form. Memory is consolidated into concepts that are only approximate representations of the world. Spoken and visual language is a complex set of symbols held in memory as highly ordered abstract categories we either fit new information into or must ultimately break down and rebuild as new experiences require. 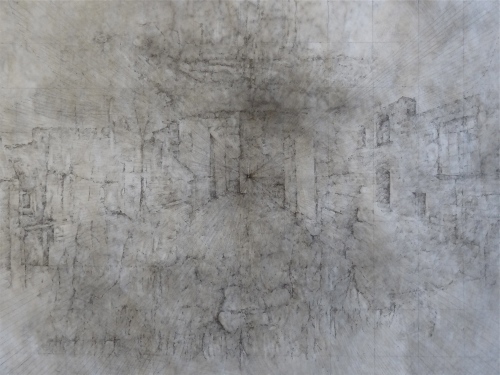 My purpose in coming to this residency in Caylus is to observe the influence of new sensory “information” such as landscape, language, the built environment and history on my drawing. I work from the assumption that individual mark-making is a reflection of the mind that constructs them and the various concerns that an artist brings to the creative process. 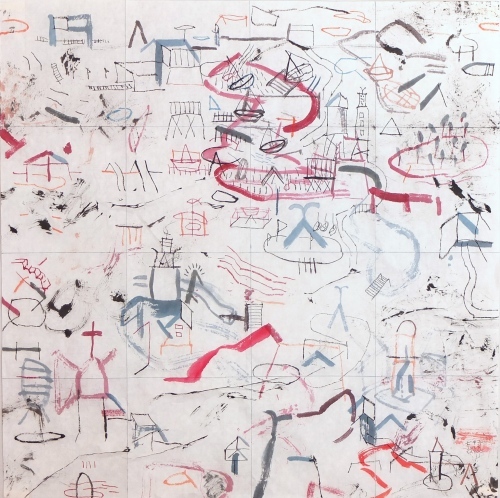 Because I have always paid close attention to mark-making as a cumulative expression of unique individual experience, it is also fascinating to observe the creative process and intentions of the other artists in the residency; to discuss their ideas and enjoy the richness of experience they express in their drawing. Art work is also a desire to communicate our experience from moment to moment; a desire to express the our intense sensory impressions of the world and and the ideas they inspire. Making art feels like I am trying to somehow capture the moment and hold back the progress of time and decay. My work may be characterized by an inventive cut-and-paste sensibility where disparate elements combine into new and hybrid entities. 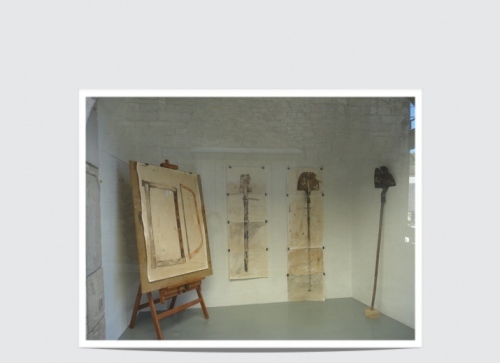 I make a range of art from mixed-media collage/drawings to monumental public sculptures. Consistent throughout my work is a desire to invite the viewer to explore deeper and to understand human experience in a larger, more unconventional way. Recently I have been concerned with discovering or uncovering connections between the human experience and the ‘body’ of the earth. Many of these works relate to aerial views that expose underlying patterns such as geologic formations and fluid dynamic structures. I seek to create a sense of the resonance of various forms and structures, be they small biological phenomena or vast maps from space. I hope that the experience of looking at my work is similar to a walk in the countryside; we see the lay of the land, the big relationships; then lying down to study the soil close up, we discover a small busy world of insects, roots, and moist earth. Within this microcosm it seems another universe exists. I hope to create a sense of expanded self, a spatial extension of self, in which the human systems include arteries, veins, rivers, oceans and air currents. The interpenetration between self and the world-body is an essential element of human consciousness, often missing in contemporary experience as we isolate ourselves from the natural world and its forces. Born in Chicago, Illinois, I now live in upstate New York, where I am an Associate Professor of Art at Ithaca College. I have converted a barn into a studio, where my partner and I also keep a small apiary. I am perhaps best known for my three commissioned public sculptures, including The Clayton Jackson McGhie Memorial, the first large scale memorial for victims of a lynching in the United States, located in Duluth, Minnesota. In these drawings I use various Delaware designs to signify both Colonial history, and the migration of decorative surfaces, which relates to the assimilation and control of colonial landscapes through material wealth and labor. In these works images of delftware, fabric and wallpaper patterns appear to be melting or dissolving onto the landscapes and figures, intervening and interrupting how one would otherwise naturally view the narrative characters and their relationships to one another. I am particularly interested in the role of women in this historical period and how in these instances of colonial imagery women are categorized through their relationship to luxury goods and racial identity. Here I have taken the work of Augustus Brunias, who mainly painted women in "everyday" social spaces in Caribbean life, for primarily European audiences. I am reconstructing and interrupting his works to explore representations of women and gender hierarchies in drawing imagery, and the cultural use of the decorative arts to mediate these relationships to the viewer. Close observational drawing has always been at the core of my work as I attempt to capture not only the physical attributes of a subject, but also the more intangible emotional aspects. With a consistent tendency towards intricate detail, I try to understand what I see and feel around me in the world through my drawing – even the smallest detail can hold the greatest significance. 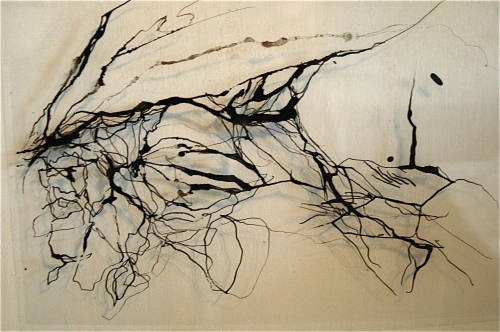 I often incorporate translucent materials and unconventional modes of display in order to explore the transformative effects of light and scale upon traditional drawing techniques. At DRAWinternational, my primary aim has been to challenge my current practice and achieve greater complexity in my work, both in concept and technique. During my three-month studio investigation, I have attempted to break away from my habitual mode of working in what was a purely literal, representational and highly refined way, and to introduce more spontaneity and intuition into my process. Since the start of April I have been on a journey that has shaken me out of the inertia I was feeling before I came here. 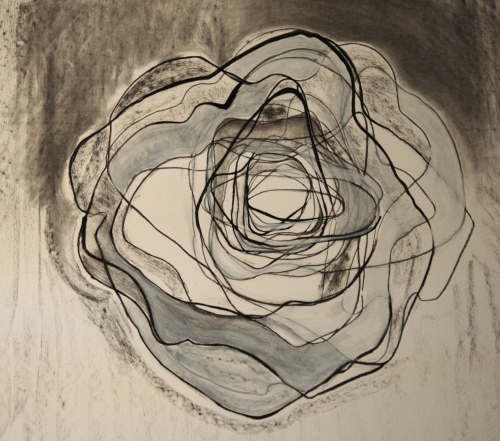 I have made a huge shift in the way that I view my practice, and in the way I think about the nature of drawing itself. I’m learning to trust myself to make the right mark, to find the right language, to search for the right line, and to allow for the time that it will take to find it. While the subject matter of these works seems to be disparate, what links them together is a preoccupation with the idea of the space in between things: the space between life and death, between love and loss, between waking and dreaming, and between madness and sanity. Spiders inhabit the spaces in between. Even this residency itself has been a space between. Spiders, or more specifically their webs, have caught my interest here in Caylus. Almost by accident I came across these remarkable forms which I’d never encountered before at home in Australia. Unexpectedly, without even trying, simply by just being, the spider has opened up a new dimension in my practice – a dimension that I will continue to explore further in the months and even years to come when I return home. 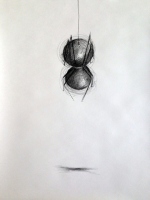 The spider and its web have taught me a number of lessons about the drawing process. One begins with certain parameters and skills, but the process is open to changing and adapting as it goes along. Strong supporting foundations are essential, but if a thread or a mark goes awry it becomes part of the design. There is no predetermined finishing point, but there is the need to be receptive to the environment, to observe what needs to be done, and – equally importantly – what does not need to be done. I have learned some important lessons about receptivity and spontaneity which have opened up my perception, and led me down a path I never expected. Apart from being extremely attracted to the picturesque setting of the village, upon arrival in Caylus from Australia I was struck by the history evident within layer upon layer: an ancient palette softening craggy edges etched by time. 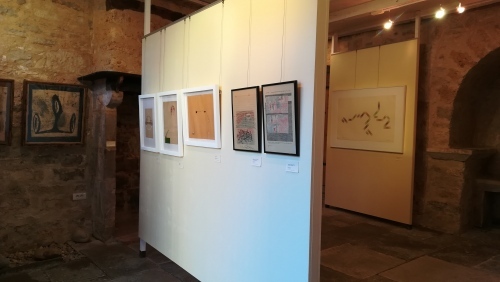 During this residency I have chosen to address this palimpsest of passing generations and events, and explore their contribution to Caylus within the present context. 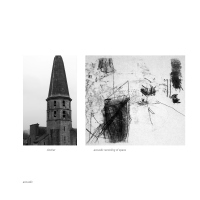 This body of work examines aspects of the physical structure of the village and its fragmentation and, the silence and beauty of the surrounding landscape: necessary partners in the completion of the whole. Representation of this overwritten past is reflected in the use of materials and technique selected in the creation of my work. Fragmentation and obliteration juxtaposed with the activities of daily living somehow unite in a gentle harmony binding past and present with grace. In September and October 2015 I walked 800km along the Camino de Santiago in Spain. This is an ancient pilgrim route that took me six weeks to walk and provided ample time for a parallel inner journey. In this residency I have been exploring ways to express the deepest of my emotional experiences that arose during this epic journey. The work I have started here will continue after I return home. Using specific music to help evoke the feelings, and using 'close-up' mark making to discover the right visual vocabulary. Working through several large drawings to reveal the imagery and sense of touch that best express my feeling. During this process of repeating and evolving the drawings have revealed various facets of the complex emotions that I experienced. “You're very clever, young man, very clever," said the old lady. "But it's turtles all the way down"
doughnut, coloured beige or green. This argument over the incomprehensible nature of reality begun with two pre-Socratic Greek philosophers. Heraclitus (c. 535-475 BC) posited in his 'Fragments' that change in the universe is the only constant, so only human perception is responsible for the appearance of order. Parmenides (c.515-460 BC) argued in his writings that there is pervasive order in the universe; that change and chaos are a fallacy - the result of our perceptual limitations. 'it's Turtles all the way down'. I've begun making illustration and drawings inspired by ‘The Melancholy of Resistance’ by Lazlo Krasznahorkai. In a Hungarian village, impending chaos and doom is marked by the arrival of a two-man circus carrying with them the stuffed body of the world's largest whale. Each citizen has their interpretations of and reactions to the towns' decay, looking to any form of order from cosmology to fascism. In the same vain, I look to this book to understand our apocalyptic times. Secondly, I've been creating my own surreal circus: a cast of characters tied to their champagne cage-chairs. Like the flapping flamingo dancer teetering on the edge of her stool - between flying and falling - each member of this parade is both pathetic and magical. 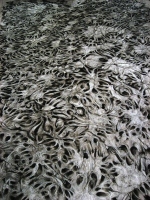 Using the language of textiles, my work explores themes of personal and collective memory. In this work, I am particularly interested in investigating this theme as it is revealed through the layers of wallpaper and debris present in the old studio space. Reading the wallpaper as if it were a text, I have dissected and reassembled it in a series of installations and subtle interventions to explore the psychological space of the domestic interior as it intersects with the natural world. We are blessed with the miracle of sight. Standing in a field, our two eyes take quick snapshots of the patterns of light in the environment. By some miracle of the brain, these little snapshots build one coherent picture. The field looks like a field, not a confusing collection of shadows and angles. We perceive it as whole. And yet, that whole is just a fraction of reality. There is an unfathomable amount of visual information that we simply can’t take in. Compared to a hawk, we are painfully nearsighted. Compared to a bee, we are basically colorblind. I can’t look to my left and my right at the same time. I can’t inspect a pebble while I gaze at the clouds. This paradox of vision—its completeness and its inadequacies-- is at the heart of my practice as an artist. The drawings I have made at DRAWinternational are inspired by my visit to Claude Monet’s gardens at Giverny. For me, making this work about different ways of seeing is a way to consider both the beauty and the mystery of the world. There is no such thing as a point, some say. Neither is the point a thing, essence or idea, nor a proper figure. This disrupts any intellectual or philosophical position. And in terms of drawing the point is obscure; as it is so often perceived in art today, every kind of mark, even a dot [ • ], is presumed to be the line – the more ‘proper’ figure. We should then ask: during my residency at DRAWinternational, why have I decided to explore ‘the point’? Indeed, it is multiple, visually direct like this [ • ], or other spots and dots we encounter everyday. It is also a spot of pressure, a point of gravity one feels. It is a kind of traceless trace, neither hidden nor thinkable in some space beyond. As a notion, ‘the point’ has remained highly important in my work and writing. 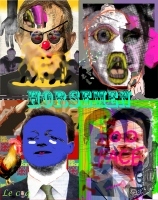 Since 2008 I have made and exhibited works engaging drawing, performance art, and video. 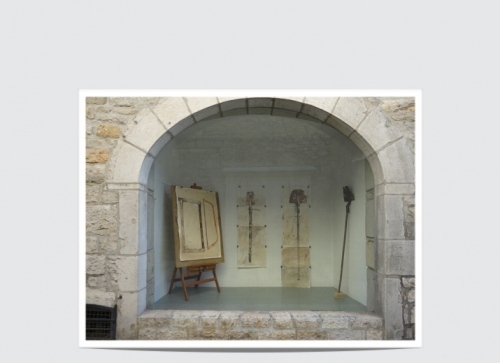 The works I have made while at DRAWinternational, in Caylus, continue to explore this notion. This time through two ways: physical action and space. The new studios at DRAWinternational became, for me, spaces of decision. In other words, locations to choose and retrace actions I found myself making in and around Caylus – for instance, passing through narrow corridors and hiking paths, or working with shadows made from my body, in daylight or at night under street lights. Practically speaking, I decided to use materials I felt to be light and familiar: tracing paper, highlighting markers, white-out liquid [‘Liquide Correcteur’], elastics, magnets, electric lights. I was interested in how such materials could be used to indicate, to visually direct and emphasize, where and how I would make a work. Here ‘the point’ became less about making a mark, or figure, and more about giving form to decisions – how to start picking up an elastic, or where to make a final step in a dark room, for instance. Overall, these works happened through forms of gravity and lightness, boredom and comedy, a drifting of time into different spaces, different ideas that I now wish to share with you. I explore the line and the physicality of the mark, capturing space where inside, outside, and in between are related. My work is also influenced by the landscape, but not necessarily to represent it as it appears to be, but to suggest the essence. I’m interested in the way nature grows, it expands, it spreads. My main inspiration comes from branches, stones, plants. I cannot think of myself separate from the environment. Walking also makes me think about different paths, and the paths I’ve taken while walking and while drawing. Things I take from the environment and give back to it. I explore the road in a similar way that I explore the line. I consider the direction, the speed, the weight, and the change on the surface. The materials I use are water and ink on paper. I’m interested to see how the water carves the surface on the paper, and the way the ink contaminates it. I set the space for the drawing to emerge. With subtle movements I draw with water and then wait and see how it evaporates leaving the trace of the ink on the paper. The experience of being part of this program has been important to the development of my work. The DRAWinternational residency allowed me to re-think concepts in a new way, and to explore new possibilities. I’m grateful to John who challenges my point of view, suggests new ways of doing things and has followed my process giving me advice in an honest way. Also thanks to Greta who has encouraged me to explore printing and this is something that I plan to develop further when I go back to London. 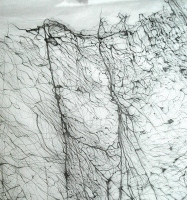 In the world of textiles, a drawing can only emerge after a selection of thread has been made. 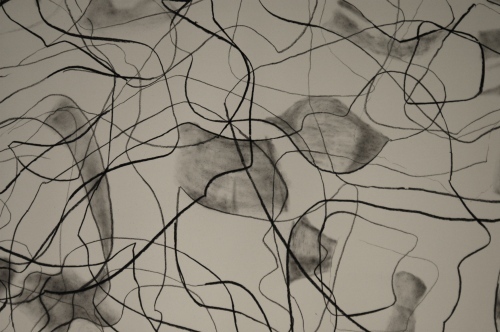 The material dictates the drawing - its texture, colour, transparency, pattern. In and around Caylus, making thread was once even a way of life. Prior to the Industrial Revolution, artisanal spinning and weaving were prolific industries that employed more than 5000 people. Women in St Antonin spent their days spinning hemp. Montauban was famous for its silk and wool manufactures. 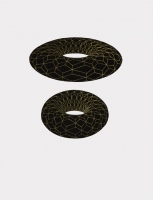 As a material, thread is a line, used to construct a surface. I am interested in the relationship between the thread and the hand-drawn line, the material and the human, the natural and the processed. I have kept processing done by others to a minimum, choosing to use natural pigments from Roussillon, hand-made paper from Arles, and raw fibre when possible so that the act of making becomes part of the drawing. 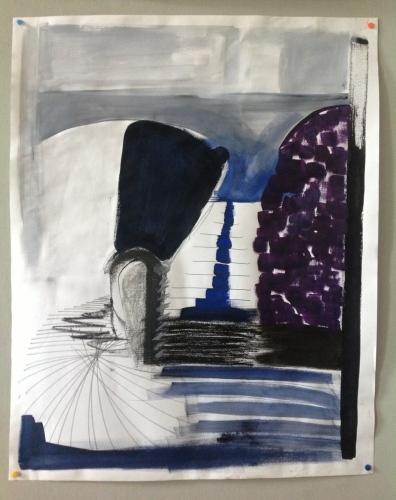 In doing so, I hope to connect with the materials so that the drawing can emerge not from my interpretation but from my capacity to listen to my materials. The result is a collection of surfaces and 'textiles' that investigate the materiality of thread and the expressiveness it conveys. 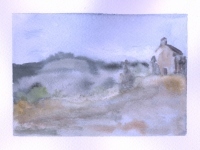 Most of the drawings I have done in Caylus are landscapes. There are no actual physical places involved, but the conventions of the genre are an excellent environment for my purposes. It allows the eye to travel quietly within the boundaries of the canvas, fixating briefly on anecdotes and objects, but picking up all the details along the way. It also allows me to travel on the canvas with the brush and discover the landscape for myself, surprising myself. All the shapes, colours and object are symbols - not for concepts, words or ideas, but for processes, transformations and emotions. 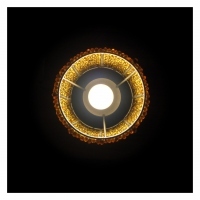 I am interested in a symbology of vibration and energy. This residency has been cut in two parts by an unforeseen change of studios: from the welcoming, bright studio in front of 'Le Lagardère' to the more secluded and intimate hall in 'Salle Ossip Zadkine'. I always do my best to be as open and sensitive as possible to the physical environment I work in so I was not surprised to find my work considerably changing from one place to the next. In the first part of the residency I felt very much like the studio itself: open, warm and friendly. 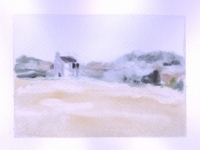 I felt connected to the energy of the town, the environment and the town history, and this connection produced a series of around thirty landscape drawings in only a few weeks. This productivity was driven by a simple joy of creating and the enthusiasm of developing a visual language in a consistent way. In Salle Ossip Zadkine I could not take that same investigation further and discovered a different Caylus. I was confronted with social structures and community issues. The series of drawings that came forth from the new studio were scenes of people in social situations copied from a book I found in the local library, painted in very light tones of pink and red. They could not have been more contrasting with the previous work. 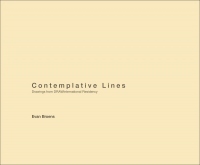 I have been thinking more and doing less, reviewing the work I did previously, inventing titles, reading and writing. There were visitors in the studio that came by and asked me "what is the point, what does it mean?" Luckily, I do not have a final answer to that question. A pigeon leaving footprints in the snow is something we can all enjoy without being suspicious of the message it has for us, and I aim for the same effect with my work. The difference between me and the pigeon is that I am conscious of my drawing, and that I am a slightly more complex being, but I do my best to keep my spontaneity regardless of these handicaps. I am developing a series of drawings written in processing computational language and executed on the Java platform. The processing language permits the insertion of random variables on the code, making the drawings slightly different each time the programe runs. Each drawing represents one specific geographic coordinate and a specific time, based upon my personal experience of the space. By adding objective and subjective data, historical information, a textual narrative, movement and the code itself, I intend to create an approximation between the map that I am drawing and the territory that I perceive. This work continues my previous research, which investigates the interrelationship between three concepts: the social and physical space; the individual perception of space, and the representation of that space. At DRAWinternational I am developing an artwork entitled Caylus, where I represent “La Place de la Mairie”. I decided to draw the square because of its central location and its function as the town’s meeting point. I also enjoyed working observing/sketching there everyday in the café and therefore it became my central viewpoint of the town. The artwork is based on that particular perspective. The houses on the map were classified, based on information provided by “Le Service Inventaire du Patrimoine du Pays Midi-Quercy”, where notably Sandrine Pradier helped me with the historical and patrimonial research. 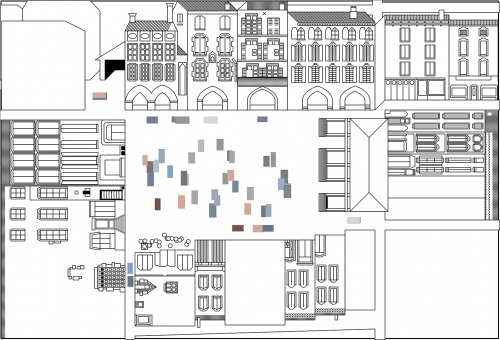 The colours in the composition were chosen from the colours of the buildings and doors in the square. I photographed all the doors and used a statistical method to transform each image to one colour. I found two main categories of colours: the browns and blue-greys. The research led to an understanding that these particular colours are historically related to the materials of the sub soils on site. 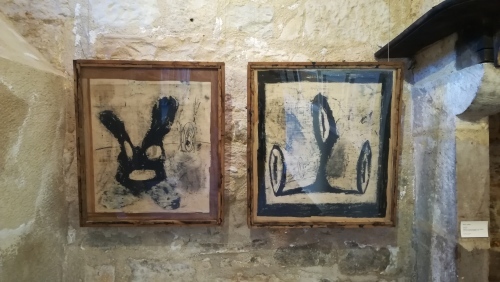 I spend time in different environments and respond to the different sensory stimuli through mark making and printmaking techniques, exploring the tactile nature which surrounds me. 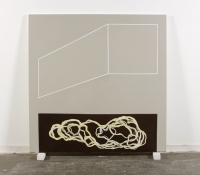 These structural spaces are metaphors for the human psyche which call the viewer to question whether one is running towards a center or escaping it. 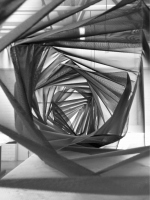 The work I make examines the geometry of light through sculptural form with light acting as the intermediary of inside and outside. Light, in this case, features as the passageway between the two states, which encaptulates the physical body and the abstract mind. Contemporary life is characterised largely by constant and rapid change which builds upon previous advancements to create new ones. Current societies exercise power to shape and control the physical environment and interpreting our place within it becomes increasingly complex. In the face of a reality that is constantly changing each one of us finds a change in our attitudes and behaviour. This is a mentality that is not necessarily fixed, but is one which is able to keep up with this rapid flow to create new and shared responses that are both dynamic and reflective. An individual's sense of self is determined by the perceived relationship with the experienced world. As soon as I saw this image on their web page, I sent an email to DRAWinternational. 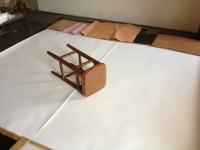 I also want to learn how to draw from under a stool: this is my project. I wanted to start from square one with regards drawing, from zero and I've done it. I have learnt how to hold a pencil, use charcoal and manipulate an eraser. I have learnt how to draw a line, a choreoghraphic trace where the gesture of the hand upheld or relaxed is revealed, its strength and its sensitivity. I learnt to draw with my body, bodies, its limits without limits. On the last day, after days of hard work, I was ready. I had acquired the knowledge necessary to draw under the stool. Alas, I am back at home. I hope to return soon this time to draw under the table, and once again with the stool, and why not a shot at under the carpet ..... another under the clouds until one day I can draw with the world on my head and then I'm sure I will have arrived at NIRVANA. 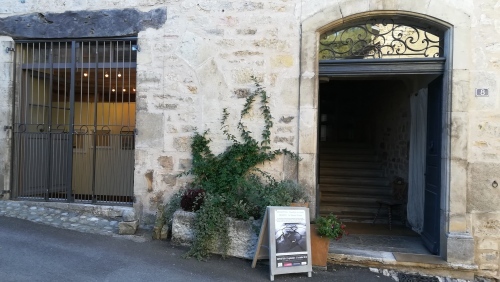 A big thank you to John and his team: firstly, Grete ensuring with mastery and generosity, among other things, dinners with exquisite food, and, secondly, Aloise the beauty of Harry Potter, guardian of the castle of drawing in Caylus. 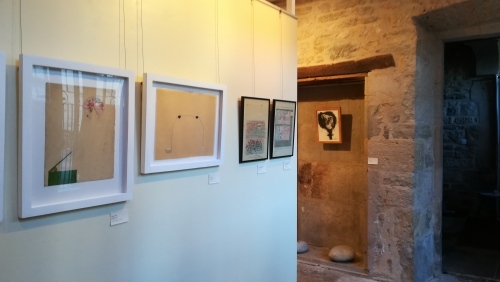 "During the residency at DRAWinternational in Caylus, France I am focusing on drawing portraits from life of seven people who live in Caylus and seven hand tools. In some cases I am drawing the portrait of the person involved in their work and interacting with the various tools of their trade. It appears to be a very physical craft which involves an almost sensual relationship with the chair. She holds it, embracing the chair in her quest to reform the appearance of an uncovered antique. She pulls the chair close to her chest, she strokes the fabric, she taps with the hammer and pokes with tacks, she turns the chair to face away and works on the back. It is like a dance and struggle at the same time and a metaphor for human relationships- the push/ pull effect. Nathalie is artistic in her craft, she is totally absorbed with the chair. This chair is ‘rococo’ in design with curled legs and a high back, the material a crushed aqua blue . 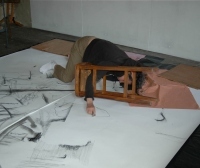 The whole drawing experience is a performance both for me the artist drawing and Nathalie the upholsterer. I have also drawn portraits of the artist Colin Castell in his studio. This has been a unique experience because this portrait involved Colin Castell drawing my portrait at the same time as I drew him. We set up easels opposite each other and would have times to pause, look, then draw. The rhythm for each activity was surprisingly similar. This process seemed like a dance, with both Colin and I stepping backwards and forwards from our easels scanning and conjuring images of each other onto paper. I have drawn mosaic artist Alice Popelin, painter Jacques Hue, ceramicist Alison Graham, sculptor Thomas Lefort and Aloise Mcnorton. The act of portraiture is an act of faith and a search. Alex Miller in his book ‘the Sitters’ alludes to the idea that for portraiture to work the artist must watch and wait for the shy beast to come out of hiding….that the skill in portraiture is seeing beyond the face and that it is important not to be trapped by the likeness….It is a quest, beauty or the beast. Portraiture from life is an unusual social state because there is no other time when it is socially permissible to stare so intensely at one person for possibly up to two hours or more. The hand tools I am drawing include a shovel, a spade, upholstery tools, saws, a rake and a sythe which are in various states of decay. The tools, initially new, are defined through use and time, the forms change and are moulded and sometimes lose their function completely. What remains is a form stripped back, altered, at times delicate (like the shovel) and beautiful through the combined aging process of abrasion, exposure to the elements and rusting. These tools become a metaphor for the human condition. They are portraits of a life and like the portraits of people reveal stories of their past." With the support of both DRAWinternational and Wales Arts International I was able to immerse myself into an incredibly inspiring and unfamiliar environment and to explore and develop new approaches to drawing through the medium of ceramics. Focusing on principles of creating space, depth and movement through various methods of applying colour and glaze- ideas underpinned by my doctoral studies-I developed a new colour palette, drawing methods and compositions directly inspired by this ancient and beautiful medieval location in the south of France. Furthermore, I developed a new and exciting approach to my ceramics practice; one which echoes properties of both printmaking and watercolour techniques, whilst utilising the unique alchemical properties of ceramic colour, glaze and clay. Managing the exhibition on a daily basis, alongside regular demonstrations of my techniques in my studio to visitors, allowed me the valuable opportunity to network, discuss, debate and disseminate my research findings, principles and inspiration to a wide audience of artists, makers, gallery owners and the general public, in both English and French. New developments in my ceramic practice will be exhibited at The Great Northern Contemporary Craft Fair (GNCCF) in Manchester, October 10th -13th 2013 and at CRAFT 2014 trade show (alongside Top Drawer and Home) at Earl’s Court, London, 12th -14th January 2014. I brought sketches and colour images with me to Caylus which were created over the last two years. These were thin black line drawings and experimental colour patches or mark-makings that were not necessarily paintings. I want to paint like I draw. I intend to recreate my drawings through an ongoing process of painting. I want to put down and take away images on a surface in order to construct some kind of visual reality for my experiences. 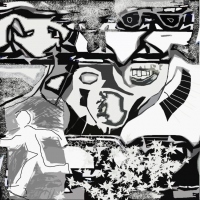 These are now evolving into abstract or dream-like representations. 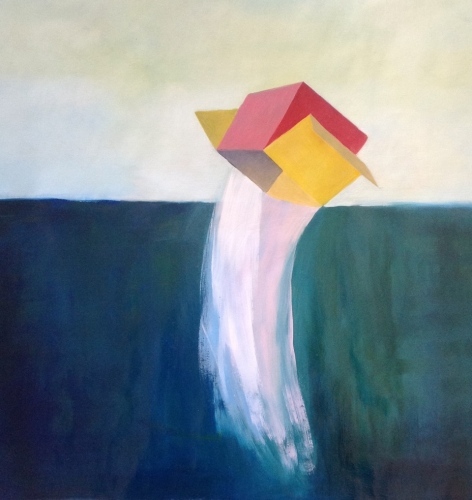 The strongest motifs that have emerged these last few weeks have been images of boxes, water and light. And currently, the most important aspect of these images will be how they may move or be situated or treated within a framed surface like canvas or paper. The edges of forms and also of surfaces is beginning to inform my practice within drawing and painting. An action of being suspended can take many forms. Prepositions, such as above, below, on, under, in, out, within, immersed, beside, between or around, have an important significance for me. 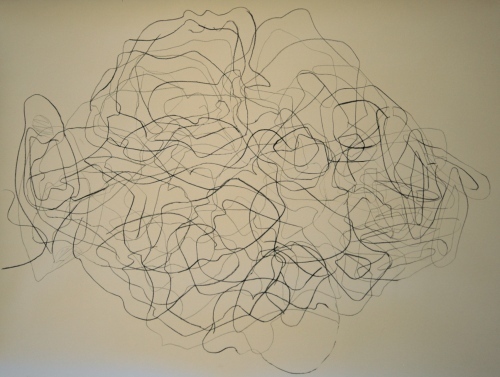 My work in drawing is to try and understand how a person may interact with the space immediately around them but also the space around them that they cannot reach with their physical body. I often use the language of dots, lines and areas of colour to express these thoughts. And the movement the drawing tool or brush in my hand, or even attached to my body, allows me to find and show my own sensations within a specific moment in time. When a body cannot quickly process the information from their senses, when it takes a certain amount of time to realise where their body is in space, then the perception of the space around, near or inside their body is unbalanced, confusing and scary. Drawing is like a performance and I have put myself in a situation of being unbalanced in order to understand what it feels like to be blind and confused wherever I may stand, step forward, rock sideways, fall down or lie flat. Horizontal, vertical and diagonal directions are then important to contemplate also and I can use line as an exploration of space. Playing with the characteristics of lines as being straight, curved, interrupted, fast, slow, hard, soft, above and below, thick, thin or blended are significant for me in order to express truthfully my reactions to being uncomfortable and forces me to think about it objectively. 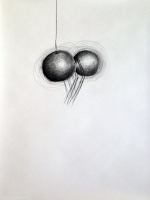 Other techniques have surfaced within the process for me, such as memory drawing or peripheral vision as when one does not focus on the image being created but the space around allows one to feel rather than see what is happening at that moment. The box, or the container, is a form that allows me to connect both my linear drawings and my colour thoughts. It also develops and interacts with other symbols or movements that are created as I progress and produce work that is about spatial sensations. Painting lets me work at a slower, more thoughtful pace as I contemplate unresolved ideas from my sketches. I am also interested in the idea of another world, either a heaven, a suspended heaven, or even a fifth dimension where we can look at ourselves from a different space outside of the ordinary one that we know. Water and light are tangible sensations that I can relate to myself in order to express abstract thoughts about a heaven or an earth. When an exhibition celebrates the past and present through "the shoe." Having come of age in what we call the “Knowledge Economy” I am particularly interested in my own lack of understanding of historical processes—specifically agricultural, culinary, building, mechanistic and medical knowledge. 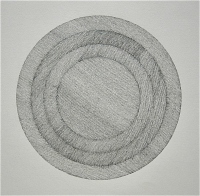 My drawings stem from my examination of these unfamiliar spaces, objects, species and processes. My recent drawings examine agricultural history and cultural memory. 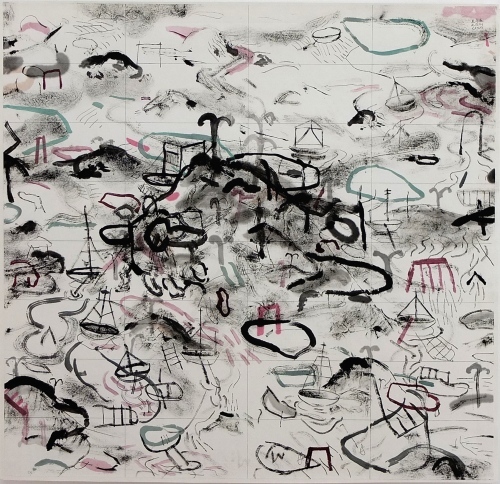 My large-scale charcoal drawings merge natural and manufactured forms with landscape. I combine subjects drawn from observation with those done from memory—animal specimens, wood, furrowed fields, and abandoned architectures. I have made drawings in charcoal by mimicking the tension felt in my hands and arms while I held the pheasant and pulled away its feathers. Relying primarily but not solely on the motion of plucking, I continue to work into the drawings using charcoal, eraser and graphite. I aim to merge the drawing process (the doing—faisant) with the subject matter (the pheasant—faisan). During the residency at DRAWinternational I have continued to examine repetitive linear drawing, investigating ways of manipulating simple lines. 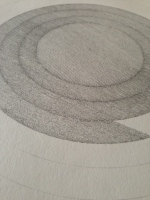 I have employed concentric circles as guidelines for this process. 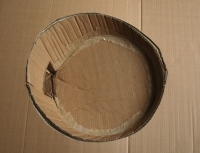 My project is a mathematical interrogation of the space within the circle. I have been exploring this process by working with the length and direction of line, speed of application and points of change. By setting up more rigid constructs, I maintain a curiosity with regards to the outcome of this obsessive act. The simplicity of a line repeated highlights the variations of the gesture that would not be present in a mechanical process. I arrived at the studio wishing to develop a far greater breadth of drawing skills, along with an understanding of new materials and a more critical questioning of my practice. 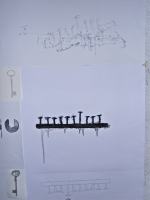 During my time here, I have selected simple, often overlooked objects and transferred these to a series of drawings examining different techniques in each. 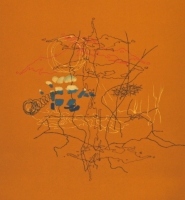 These approaches have included the use of pastel, oil stick, ink, drawing pens, graphite, blind tactile drawings, reverse light drawings and rhythmical pattern drawings. I also wish to thank those that have donated their own unique items for me to examine, record and to tell graphic stories with. Art is, in a certain sense, an instrument of research from which to explore the mysteries of life and the universe. Painting, as one discipline, can enable the expansion of vision and all its creative powers. Therefore, for me to attempt this requires a production of many pictures from the same source which feel united by a common idea of separation. In this way it is not art for art’s sake but for communication itself. An intense feeling for life and a vivid sympathy for human sorrow and suffering is a concern. Life as it is witnessed first hand and by way of the media can lead some to a restless and introspective preoccupation. At times this can manifest itself as a deep and painful pessimism created within an environment of dread. Contrariwise, this very dynamic in all its machinations can be appreciated as a lesser and more invigorating force of nature. Many of us try to move toward a more mature and positive view of human existence through positive, thoughtful contemplation. As an act of faith each of us has to offer an element of hope and sensitivity through the way we live and what we create. Thoughts on drawing. Drawing on thoughts. 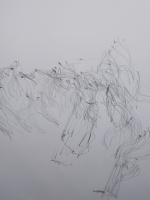 Drawing - its choreography, realization, and articulation - is about learning. Learning the form, learning the looking, learning the idea and meaning. It is through drawing that we learn to comprehend the thing that has arrested our attention. There is a way in which a line, a mark, a gesture, is made. No right way or wrong way, but a specific movement, weight, and relationship to the indication of that specific line or mark. How a mark is made is numerous in its possibility, and within that spectrum the possibilities continually unfold. The unfolding happens between direct and indirect mark making. The way in which the line is drawn ultimately comes from the body, and how it manifests will also position the work in relation to scale. Its about finding how that line needs to be, following its trajectory and pushing the possibility spectrum in finding the way of the line. Where does a line begin? Years ago in the dusk before the twilight, a few days from now, in the slight pause of a hand held in fear and caress, yesterday. Page is not where it begins, nor where it seeks to finish. Being at DrawInternational has provided me a terrific opportunity to extend my practice in a fantastic space with wonderful support. And being in Caylus has given me the space both physically and conceptually to explore other aspects of my practice. I chose the Coq initially as it represented France, but as I explored it as a subject, I was surprised at how the various posturing and preening resonated with human, specifically male, characteristics. Masculinity, pride and ego are all at the fore when regarding Le Coq. These are things that occur to me as I view the world politically, locally and whilst regarding personal relationships. The Coq here represents so much about humanity and these works will resonate across cultures given the ubiquity of the animal in all its variety. Indeed, in more developed countries/cities more and more, people are keeping chickens in suburban areas- as indeed I have back in Melbourne, Australia. The choice of pen harks back to previous abstract drawings I’ve made. However, the fine rendering is new to my practice. I see drawing as the working idea. As the idea develops, so does the drawing. I also consider the sculptural aspect of my practice to be a kind of drawing. 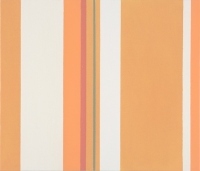 An assemblage of lines to express an idea that is hollow of form but lineally describes an object or space. utilizing the generic email system and creative packages within the home computer suite. 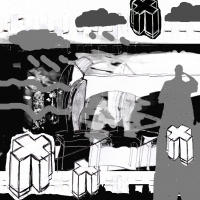 Drawing occupies a central role in the work, often being both the initial drawn component scanned into the PC, and an integral part of the images development as it zips back and forth between collaborators in file format. and drawings are instigated by either collaborator. Although this form of pictorial communication is itself the primary subject matter, each individual dialogue is representative of concerns, expressions and incidents based on our own particular experiences and personal histories. We literally draw out the threads of our daily lives, ritually recording the most pertinent in sketch form. ARTIST IN RESIDENCE - Christine McMillan (AUS)- JULY 2010 continued. The exhibition presents the work of Alan, Ruth and Jonathan Barrett-Danes referencing the fascinating connection with Upchurch Pottery and the major influences made on the next generation of potters, within an historical context of the development of 20th Century studio ceramics. From early boyhood onwards Alan Barrett-Danes was well aware of the possibility of a life working with clay. His grandfather was Edward Baker who, by the early 1950s, had bought the Upchurch Pottery in Kent where he had worked for various proprietors over the previous four decades. Barrett-Danes, ceramics has been a tradition spanning six generations and dating back to the early years of the nineteenth century. Over many decades Alan and Ruth Barrett-Danes passed on their skills and enthusiasm to generations of students, to an increasingly well-informed and appreciative audience and also to their son Jonathan whose work shows evidence of their influence while at the same time having a life and direction of its own. Alan’s experiences and training in the mid twentieth century meant that he was uniquely positioned to play a key role in developments in the field of studio ceramics in the later decades of the century. No one else was as well-equipped as he was to take advantage of that moment when ceramics opened itself up to its past and its future. In his life and work we see someone who was able to take the story of ceramics apart and then put it together again in new and challenging ways. Alan Barrett-Danes had felt it necessary to leave Upchurch and Stoke-on-Trent behind him and move on, but many people have cause to be grateful that he continued to wrestle with their legacies for the rest of his career. ‘Timescape’ opposes itself to the notion of landscape and in so doing questions the significance of the visual. Paul Beauchamp’s photographs take this notion of timescape as their starting point. Although many of the photographs are beautifully composed and rendered, they are arranged to ask questions about the visible world; they are an investigation of the site rather a simple representation of it. The quarries themselves are places that are usually out of sight, but here they are made visible and connections are drawn between the quarry and the society that made them. The quarry itself belongs both to the natural order and the civilized world: its terraces are both parallel and uneven. The photographs are mostly presented as triptychs and this format allows Beauchamp to intervene in the tradition of landscape photography and painting and question some of its conventions. Perhaps the most important effect that it has is to fragment the perspectival unity of the scene. The intervals between the photographs introduce a principle of discontinuity into the images that is quite unlike the spectacular totality that many landscapes pursue. 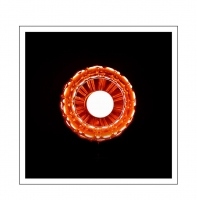 They function as a pictorial form of non-resolution. The space between the images is like a cinematic jump-cut that reminds the viewer with a jolt that these photographs are material objects. Through the use of reflection, fragmentation and juxtaposition these photographs allow us, as viewers, to bring an important aspect of our relation to the land into focus. 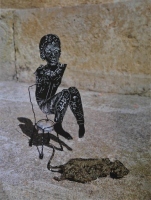 Drawings made by Anook Cléonne during February 2010. I have not painted pictures for some years as other responsibilities have taken priority. I have, however, continued to study, make and teach drawing to foster ideas in order to keep me focussed upon potential creative action. A process, one could say, of soliloquy and ‘indirect language’. The methods in these paintings on show are consciously linked to the processes employed in drawing, both past and present. The subject matter, however, is different. The overall title of these works in progress is : ‘Something about embryonic stem cells’ a project which endeavours to make open and diverse connections with current scientific/medical research, as I understand it. May I add that it does not take any political or ethical position per se. It merely uses thoughts in a free flowing way to hopefully reach a position, yes, often paradoxical, and contradictory, but dare I say, beyond dogma. This recent work has been fun and liberating to produce and particularly challeging when trying to play with such disparate ideas as they relate to content , method and aestheics. The outcomes, I see as, awkward never quite arriving and always in a state of becoming. ‘Something about embryonic stem cells’ continues to test me and I hope that it might instigate some form of collision in the minds and bodies of those who have time to look and contemplate other possible worlds. Darren William(Wales) Jason Davies(Wales) John McNorton(France). 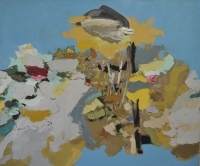 The title ‘untitled’ refers to an exhibition held at the Contemporary Art Centre ‘La lune en parachute’ which took place in Epinal in 2001 and also to my initial selection of works for this exhibition space which had no titles. 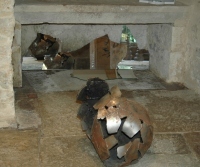 The pieces have been chosen because they are essentially made of metal and wood. They play a role as a kind of story that one could tell around the fire-place, or more precisely the wood burner, situated in the gallery space like a sculpture waiting for the winter to arrive, when it once again becomes a source of warmth. I wanted to avoid organising the show on plinths in order to use the realness of the space - stone – and propose an installation that is in resonance with the space. ARTIST IN RESIDENCE - WILL ZAJAC - April/May/June 2009. Drawing/Construction Workshops April, 2008 - West Island College, Montréal, Canada. A selection of contemporary ceramics by 15 artists from Wales, UK. A collaboration between the centre Drawinternational, Caylus, and the Centre of Ceramic Studies, Cardiff. Jacob Bodilly, a student at the Centre of Ceramic Studies, Cardiff, was invited this summer by GA2C and DRAWinternational as resident artist . The whole process of drawing and reflection for the project embraces ambition and intentions for development, which may enhance comprehension, performance, and communication skills in and about drawing. This dimension relies upon observation, insight, reflection and interpretation from a multitude of viewpoints. Drawing activities and cultural visits. 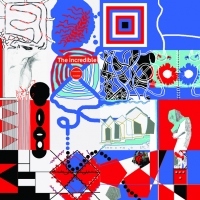 Drawing Performance Installation - avec 10 european artists. 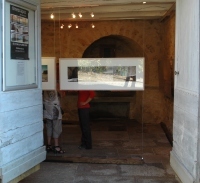 Contemporary artists create site specific works at 'Lac de Labarthe, Caylus. DRAWinternational and ACE (Art-Culture-Education) selected a group of international contemporary artists to participate in a two week residency/exchange project. This project was supported by the European Community programme Leader+ Midi-Quercy.